The Quilter Steelaire Pro is the ideal solution for the touring/recording professional. 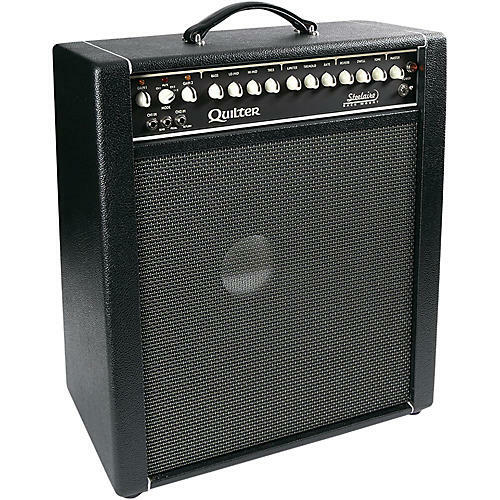 Packed with features aimed at maximizing artistic excellence, both on stage and in the studio, it is meant for the discerning professional who needs more flexibility while maintaining the light weight and effortless power that Quilter amplifiers are renowned for. Designed by Pat Quilter and tested by some of the world's best players over tens of thousands of road miles, the Steelaire uses the latest audio technology to take the next big leap in high output steel guitar and electric guitar amplification. The slimline cabinet is easy to carry and requires minimal space on stage. The front-mounted speaker, combined with Quilter's calibrated cabinet dimensions, provides maximum clarity of mids and highs, while delivering big clean lows. Our panel of experts frequently need to get on and off stage in less than a minute, so we provided internal room for accessory stowage, and cable routing slots that keep everything tucked safely away.